I bought my first hammergun 10+ years ago, and I’ve been a nut for them ever since. Breechloading hammerguns were a major step in the transition from percussion firearms to modern hammerless double barrels. Unfortunately, the breechloading hammergun period peak quickly and then fell off just as fast. Breechloading hammerguns came on the scene in the 186os, first as pinfires, then as centerfires. But by the late 1870s, these shotguns were falling out of fashion. That’s because new side-by-sides like Anson & Deeley’s boxlock and W. & C. Scott’s sidelock were coming onto the market. These “hammerless” designs caught shooters’ attention, and then a bigger and bigger chunk of the new-gun market. Even though most makers offered hammerguns into the 20th century, the numbers of them ordered would never surpassed their progeny again. That bring us to this very nice vintage 12 gauge J.W. Tolley hammergun. Made in the early 20th century, it’s what I would call an late-era hammergun, and it was delivered towards the end of the gunmaker’s career. James William Tolley was born in 1832 he started his business in Birmingham around 1858. His company was successful and by 1879 they had a reputation for large bore double barrelled guns and rifles. In about 1883 the firm opened a shop in London and around 1894 they even had a shop in New York City. Around 1919, J & W Tolley seems to have merged with Holloway & Naughton and by 1955 guns were no longer being made under the J & W Tolley name. The 12 gauge you see here has a “New Bond St. London” address on it, so it was made around 1905 or so. It looks to me like it’s a medium-grade hammergun in very nice original condition. I especially like the color on the action and the original blueing on the Sir Joseph Whitworth’s Fluid Compressed Steel bbls. Overall, it’s a heck of a nice double, and a great way to start your own obsession with hammerguns. « Eyes or nose –which one is your pup relying on? Very nice guns & article. I have an L.C. Smith hammer gun with Royal steel barrels, built in 1895. Beautiful condition. It will go to my son when the Great Ranger calls me to the Happy Hunting Grounds. Excellent. Sounds nice. Those old Smiths are great guns. 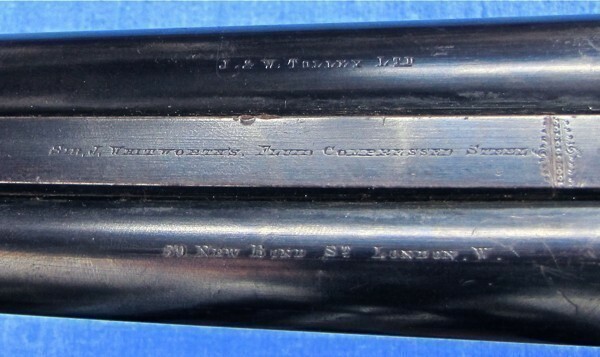 I am thinking about buying a large bore J W Tolley double hammer gun, does anyone know why the gun is engraved J W Tolley on side of the stock and near to the hammer and engraved J W Tolly (missing the letter ‘e’) on the opposite side near to the hammer. I have seen this on a couple of Tolley/Tolly shotguns and wonder if anyone can shed some light on this for me? That’s odd. Any pics you can share? I would love to take a look. I have a very unusual J+W Tolley double shotgun. 12 gauge shells are too small, 10 gauge shell fits, but only marks say “11”. All other proofmarks are very good. Not Damascus barrels. Has double ejectors. Serial number on upper tang is 1495. Has “Jones Patent” underlever opening. Marked “St Mary’s Square” which from my research means it was made in Birmingham in 1860’s prior to move of factory to London a few years later. Has the same beautiful engraving everywhere, including long upper and lower tangs, and on lever. Wood is beautiful, and nicely checkered, with normal skinny British neck, which was cracked but re-done with all original wood. All original, and in great condition. Most unusual feature, which I’ve never found anywhere else, the hammers have a swivel screw/bolt at the top, and the firing pin is about 1-1/2 to 2 inches long which then actually hits the firing pin on a shell. Have never seen that, and neither have any gunsmiths I’ve shown it to. I suspect it was a prototype, which never developed. Can send pictures if you want. Have had a couple offers, but not in a hurry to sell, too rare. Just curious for more info, or value. Sounds like a great shotgun. Send me all the pics you can, and I’ll be happy to tell you all I can.